Prepare the mussels. Scrub them to remove any barnacles and pull away the beard, then discard any that are damaged or won’t close when tapped. Melt the butter in a large pan and cook the onions for 3-4 mins, then add the garlic. Pour the Perry over and sprinkle in the sage, then bring to the boil. Turn the heat down to a simmer and cook until reduced by half. Add the mussels, cover and cook over a medium heat (shaking the pan occasionally) for 3-4 mins until they have opened. 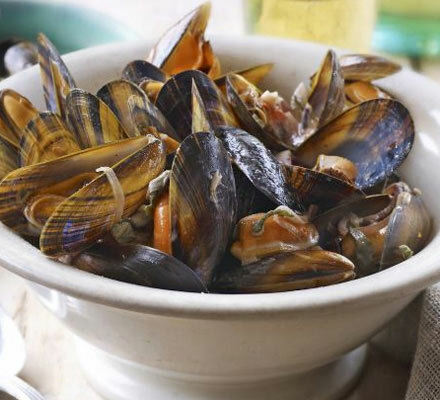 Lift the mussels into a bowl and keep warm. Bubble the cooking liquid in the pan for 2 mins, then carefully blend in the crème fraîche. Heat through and pour over the mussels to serve. Day 1: Heat oven to 180C/160C fan/ gas 4. Place all the ingredients except the pork and sunflower oil in a flameproof pan that will fit the pork snugly – a casserole dish is ideal. Season, bring everything to the boil then turn down the heat and slide the pork into the pan. The pork should be totally submerged – if it isn’t, top up with water. Cover the dish with a lid or tight tent of foil and place it in the oven for 3 hrs undisturbed. When the pork is cooked, leave it to cool slightly in the stock. Line a flat baking tray with cling film. Carefully lift the pork into the tray and make sure you get rid of any bits of vegetables or herbs as they will end up pressed into the pork. Cover the pork with another sheet of cling film and cover with a flat tray or dish – the tray must be completely flat as any indentations will be pressed into the pork. Weigh the pork down with another dish or some cans and leave to cool in the fridge overnight. Strain the juices into a jug or small saucepan, cover and chill. Day 2: Unwrap the pork and place on a board. Trim the uneven edges so that you have a neat sheet of meat. Cut the meat into 4 equal pieces and set aside until ready to cook. Lift off any bits of fat from the braising juices and tip what will now be jelly into a saucepan, then bubble down by about two-thirds until starting to become slightly syrupy. Add a few more drops of vinegar, to taste. Heat the oil in a large frying pan until hot, then turn the heat down. 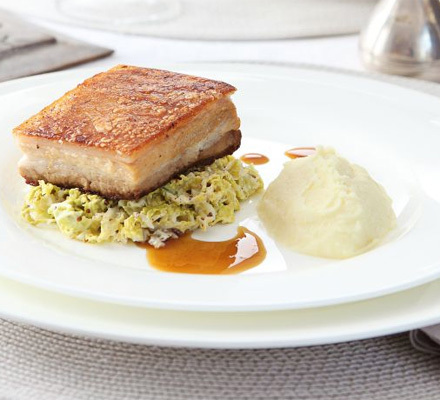 Add the pork to the pan, skin-side down – be careful as it has a tendency to spit. Sizzle the pork as you would bacon for 5 mins until the skin is crisp. Flip it over and cook for 3-4 mins until browned. Place a small pile of cabbage on the side of each plate and sit a piece of pork on top. Place a spoonful of mash on the other side of the plate, drizzle over the sauce and serve. 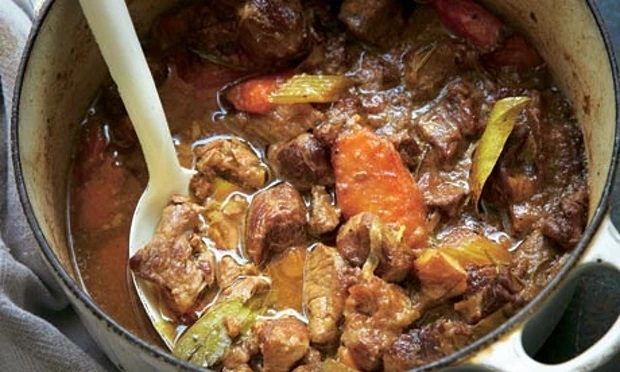 Perry is often paired with pork or chicken, but it works a treat with lamb too. Heat the oven to 130C/260F. Heat a tablespoon of oil in a large casserole dish over medium heat. Add the onion, carrot and celery, and start them cooking. Once they are sizzling nicely, turn down the heat and let them sweat, stirring often, for a good 10 minutes. With the now empty frying pan over a moderate heat, deglaze with the Perry, scraping up the brown bits stuck to the base. Add this to the casserole with the mustard and herbs, pour in enough water barely to cover the meat and veg, bring to a simmer and transfer to the oven. Cook until the meat is tender: about two hours, but start checking after an hour. Meanwhile, heat a tablespoon of oil in a large frying pan over medium-high heat. Add a third to half the lamb (depending on the size of your pan), season and cook, stirring from time to time, until well browned. Transfer to the veg pot and repeat with the remaining lamb, adding a little more oil if need be. Season again to taste, then serve with creamy mash and lightly cooked greens. Chop fruit and combine with cranberries and cinnamon stick in bottom of pitcher. Combine liquid and cinnamon. Pour over fruit. Stir well. Chill for a few hours or overnight. Stir again. Recipe adapted from Luci’s Morsels. 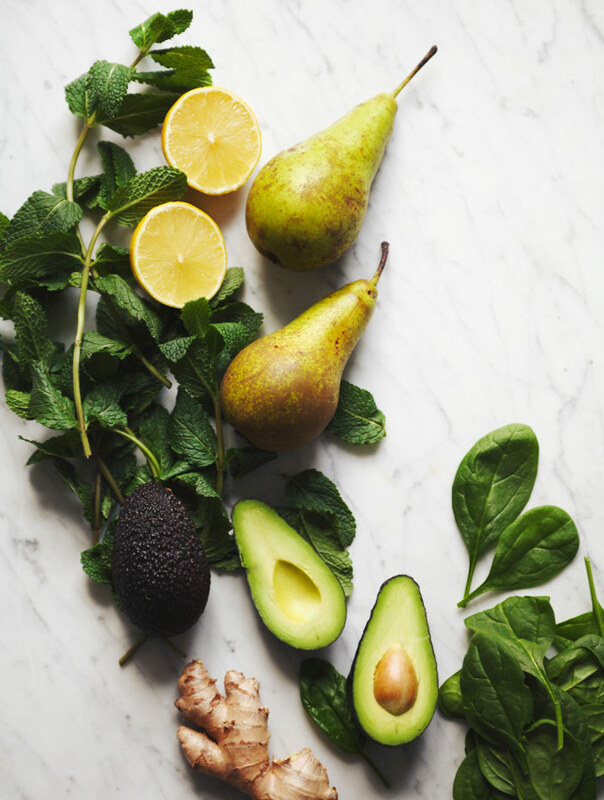 This Ginger-Mint Pear Smoothie is luscious, sweet-and-spicy with cooling mint and creamy avocado! It’s also a great detox if the winter months have seen you overindulging and have you feeling sluggish! Recipe and photos by My New Roots. Click the link for a full ‘Winter Weekend Cleanse’. If you’re not a fan of mulled wine or fancy something different, this deeply spiced pear and rum drink will warm you up nicely this winter. 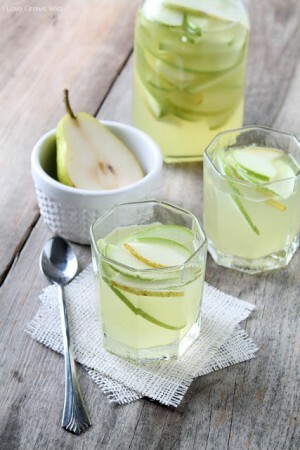 Pour the pear juice into your biggest pan then add the ginger, pears, cinnamon, cardamom and sugar. Add the zest and juice of the limes, bring everything to the boil and simmer until all of the sugar has dissolved. 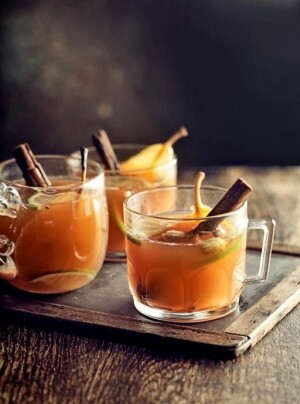 Serve warm in glasses or mugs, with a good shot of spiced rum and a cinnamon stick. Adapted from Jamie Oliver’s Drinks Tube. This sweet (but not too sweet) drink should be made one at a time in a cocktail shaker. Energetic shaking and a proper drink-to-ice ratio is key! Enjoy responsibly this long weekend. To make simple syrup, cook 1/2 cup each sugar and water in a small pan over medium heat until sugar dissolves and mixture turns clear. Cool before using. Fill a cocktail shaker with ice. Pour brandy, pear juice, lemon juice, and simple syrup over ice. Cover and shake vigorously for 1 minute. Strain and pour into a chilled martini glass. Garnish with sliced pear. Serve immediately. 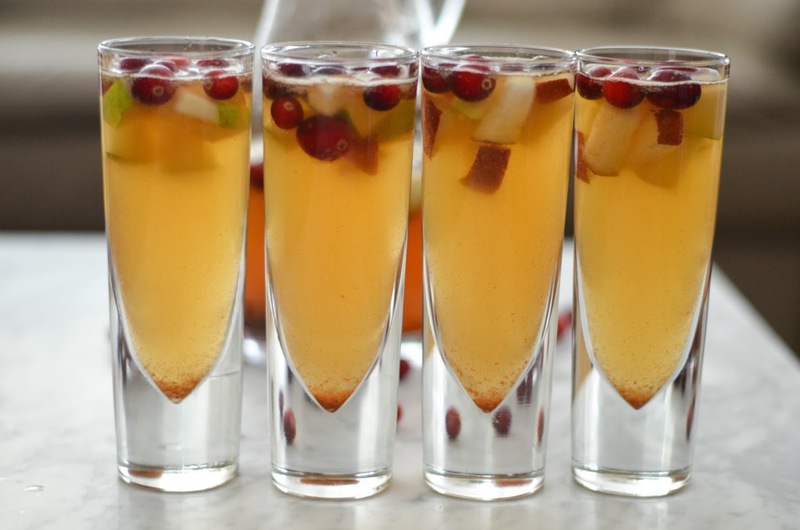 This apple and pear white sangria is the perfect beverage to sip on in Autumn! In a large pitcher, combine wine, brandy, lemon zest, and sugar. Stir until sugar dissolves. Add lemon juice, apple slices, pear slices and mix well. Place pitcher in refrigerator for 4 hours to chill and allow flavours to blend. Just before serving, top sangria off with Perry and soda water. You can also strain sangria after chilling to remove lemon zest, if desired. Adapted from a Family Circle recipe and Love Grows Wild. 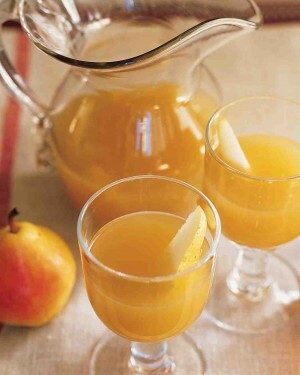 An earthy, sweet pear-cider cocktail is tinged with whiskey — a perfect drink for a cold day. Stir together pear juice, perry, soda water and whiskey in a pitcher. 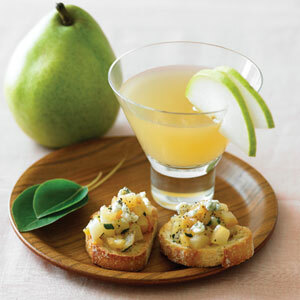 Divide pear wedges among glasses, and pour in cocktail. 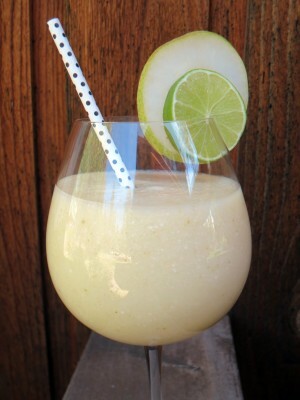 Sip on this pear cocktail on a sunny afternoon and you’ll be transported to a tropical paradise! Place all of the ingredients into a blender and puree on high speed until smooth and creamy. Divide between two cocktail glasses and garnish with a pear ring and a slice of lime.